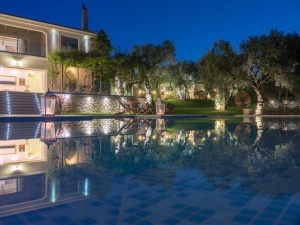 Golden July Luxury Villa is a classic Venetian style Manor that offers high standard accommodation. 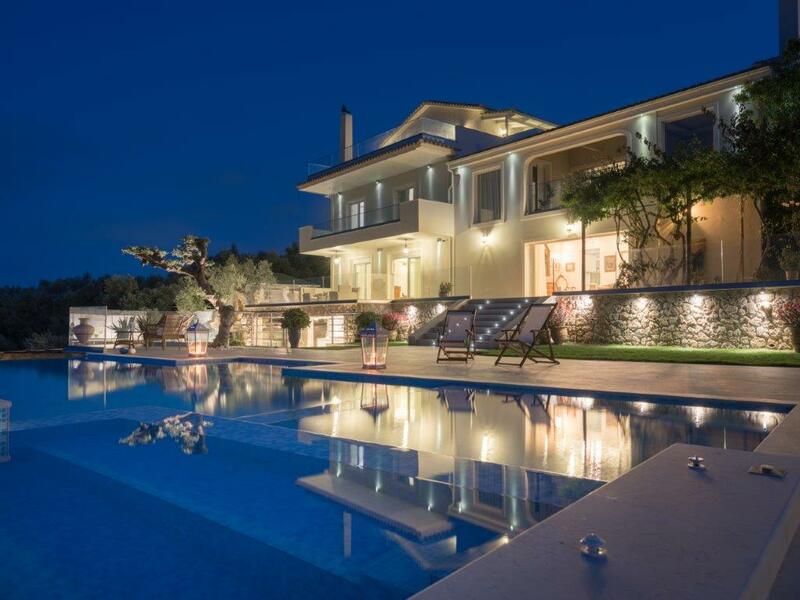 Surrounded by a large charming garden, it consists of 3 levels, designed with detail, providing spectacular view to Zakynthos’ mountains and sea. 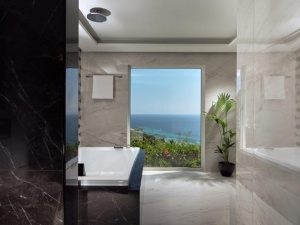 Golden July Luxury Villa is well appointed with a variety of amenities to offer you the feeling of a 5 star resort in the privacy of your own holiday home. 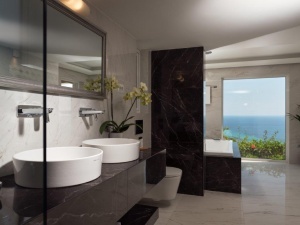 necessary provided such as toiletries and guest towels. And finally one private en suite bedroom with a double sized bed fully equipped. on your guests, and both have spacious verandas with captivating view. Finally the fourth room has a queen-sized bed with en suite private shower bathroom. is a hidden gem in this stylish manor. A separate 50sqm guest-room. It includes its own delicate living-room in white and sand colors, one queen-sized double bed and en suite private bathroom with shower and high-quality toiletries and towels. One great aspect is the large veranda with its cutting edge view. The villa sits inside 4000sqm of gardens in multiple levels. The gardens filled with vegetation of elegant flowers and trees plus the acres of olive trees surrounding the Estate offer serenity and tranquility. 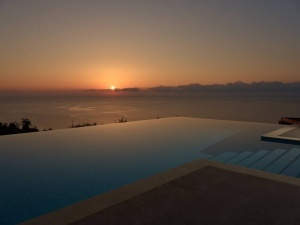 Strolling around the gardens you meet the large infinity pool facing the sunset and the colors of the Greek sky. A terrace is available for the guests to use, providing a panoramic view or the estate’s surroundings. 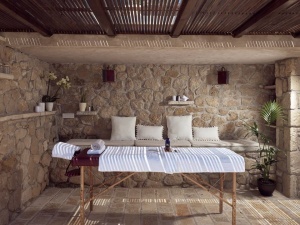 Relax in the outdoors jacuzzi and experience a therapeutic massage, moments of physical well-being, under the hands of an experienced masseur at the Wellness and Beauty area designed in a harmonic way combining stone and wood. Gather your guests to dine outdoors, near the BBQ and the wood-fired oven, and have a drink afterwards on the lower level of the estate where there is a Bar next to the artificial waterfall. During your staying at the Estate you have the ability to arrange transport, excursions, car-boat-bike rental, a variety of outdoor activities, personal training, relaxation and spa treatments and anything else you wish via concierge. From the moment you arrive and during your whole stay there will be a secured parking area that easily accommodates six vehicles, safe deposits for your valuables and surveillance cameras with alarm system for your safety. 24/7 free Wi-Fi access, a Fax/Copy machine, cable/satellite TV and DVD player. Every room is air-conditioned, hypoallergenic, soundproof and assisted by an everyday cleaning service. There is a 24/7 access to hot water. Cosmetics and toiletries, bath-towels, pool-towels and clothing by COCO MAT. All mattresses are COCO MAT as well. 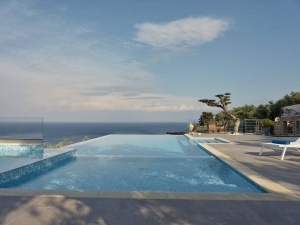 Estate is less than two minutes away by car to the Zakynthos’ Port and Town center. 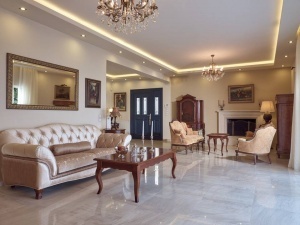 The estate, placed on Zakynthos City – Akrotiri area, is on a “key-position” that gives direct access everywhere. just 6klm from the Airport!